As his career as a photojournalist evolved, Cartier-Bresson took assignments from the top magazines of the day, like Life and Paris-Match, publications that built their reputations on the kind of photojournalism that Cartier-Bresson was practicing. Together with two legendary war photographers, Robert Capa and David "Chim" Seymour, he founded the photo agency Magnum, which would set the gold standard of photojournalism for many decades to come. 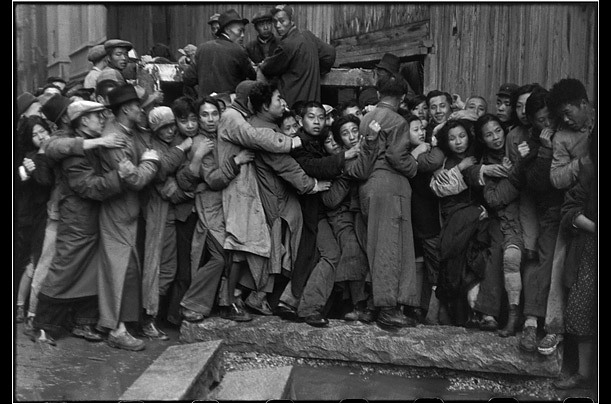 After World War II, he found himself in China, where he documented the collapse of post-war Chinese society. The Shanghai residents in this photo are trying to get gold from a bank in the days before Communist forces arrived in the city.